Hi, my name is Jim. I'm a carbinaholic. I have no sobriety. Actually, I don't collect carbines. I collect pictures and data on the U.S. M1 carbines that served with the local police in the American Occupation Zones in Germany and Austria post WWII. I do run an orphanage for the preservation of these carbines. I have 5 GI's, one used by Austria, four used by West Germany during the occupation. So far there are 52 M1 carbines this page links too, with a parts breakdown and foto's on each. About 6 or 7 of these are in NZ and provided courtesy of some of the folks on this forum, and with mucho danke to Mikey. CAUTION: this is best viewed with a broadband connection due to the number of photographs. 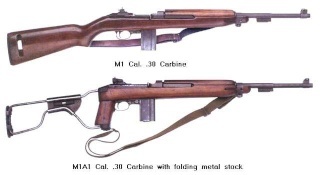 OK, I confess, I have 2 commercial manufactured post war carbines. I have a third on a 10 day wait (California nonsense). Welcome to our little site, I have just added your site to the list of links, on this forum. I hope we can help add to your information base, and I'm sure you will be able to help some of us explain the markings we find on our recent finds here, from time to time as well. Subject: Re: Hi, my name is Jim. I'm a carbinaholic. I have no sobriety.